Saturday afternoon sees Scotland take on Ireland at Murrayfield. The home side will pose attacking threats aplenty while their pack and defensive setup has improved significantly. Ireland will be fully aware of the challenge which faces them. In this blog, Hawkeye Sidekick looks at the key strengths of this Scottish side. Gregor Townsend has allowed his side to express themselves with ball in hand; carrying on the ethos from Glasgow Warriors. The play making options for Scotland are many. 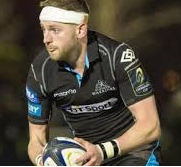 Greig Laidlaw provides experience and shrewd game management from scrum half. His understanding of the game and unerring kicking off the tee means that Finn Russell can fully focus on open play and how impressive was the Racing 92 half-back last weekend. A sensational diagonal kick exposing Italy’s vulnerable back three where Blair Kinghorn gleefully accepted for the opening try of their victory last weekend. It demonstrated invention, creativity and game awareness that Italy’s defensive line were too tight. The kick was on the money. The result thereafter was never in doubt. The marauding Stuart Hogg also comes into the equation when it comes for attacking threat. His ability to create coming into the line from the full back position is world class. His invention to the fore in his try last weekend; a deft touch to put the finishing touches to another subtle kick from Russell in behind a shell shocked Italian defense. Hogg’s big boot means that the kicking game from Scotland will also challenge Ireland in this department along with Sean Maitland and Blair Kinghorn who will be full of confidence after his hat-trick last weekend. The pace and power of this back three will expose Ireland if the play opens up into an unstructured contest particularly in the third quarter. The pack has improved immeasurably in the past two seasons, evident in the record of the side at Murrayfield (unbeaten in this tournament for the last two seasons). The pack will be buoyed by the impressive form of the Edinburgh Rugby contingent who have impressed in the set piece exchanges for club and is translated to national team duty also. Solid front five against Italy albeit Nel looks a scratch for the Ireland game which is a blow considering his form for Edinburgh Rugby this term. Dell and McInally are experienced international performers and with an abrasive and industrious second row partnership of Toolis and Gilchrist, the set piece has been on point. Solid line out call management expected. The back row unit has fluctuated due to injuries. Skinner had his opportunity but had to withdraw early to be replaced by Josh Strauss who showed extremely well in the breakdown and ball in hand exchanges. Ryan Wilson is another abrasive ball carrier. Wonder if John Hardie will be involved in this fixture for his breakdown work ability? The pack have been critiqued in recent years for their maul defense but this has improved particularly under Townsend’s watch. There is no significant weak link in this pack and their combative, workmanlike style will pose Ireland’s pack which has been disrupted with injuries. Scotland do have injury issues of their own. The back row has been depleted with injuries. I have mentioned Skinner’s unfortunate injury against Italy but David Denton, John Barclay and Hamish Watson are also key marquee names unavailable for selection in this unit. When you add also the likes of Richie Gray, Cornell du Preez, Zander and Matt Fagerson, Luke Hamilton, Byron McGuigan, Matt Scott, Rory Sutherland, Duncan Taylor, Blade Thomson, George Turner and Jon Welsh — that is a lengthy injury list. One thing is for sure. Scotland’s depth chart will be fully identified at the end of this tournament and if it is any indication from last week’s performance, Scotland will be a live threat in the pool phase of the RWC 2019 for their opponent this weekend in Ireland. The only genuine disappointment for Scotland last weekend was when Berghan was sin binned. Italy who were second best suddenly came back into the contest and scored two tries in those ten minutes of the contest. The two tries were different score concessions; first one was pack intensive drives close to the line and the second one was open play where Italy offload suddenly opened a 2:1 opportunity. It was the only negative from an excellent Scotland performance last weekend. No doubt Townsend has called this out in video analysis and the team will be primed for further improvement against Ireland. A nation expects. A nation demands a victory, that nation is Scotland! This entry was posted in rugby and tagged ireland, rugby, scotland. Bookmark the permalink.